One can only imagine how painful or how shameful it would be to lose one or two front teeth from injury or blunt trauma. The way you talk, smile, or eat would be very much affected; this is why taking precautionary measures is very important. If you are going to participate in different sports and recreational activities, knowing how to protect your teeth and face is a priority. Mouth protectors or mouth guards are used to help protect your teeth from sudden blows to the face. They can cushion these blows and they can minimize the danger of having broken teeth, or injuries on your lips, tongue, face and or jaws. Mouth guards are usually made to protect the upper teeth; they are also very good when it comes to protecting the soft tissues in your mouth like your tongue, gums, and cheek lining. According to a team dentist for the Carolina Hurricanes, your top teeth usually take much of the trauma simply because they tend to stick out more. While the lower teeth on the other hand, takes much less force from an impact simply because they are located at the back. When should you wear one? If you care for your teeth, you should consider a mouth guard as an essential part of your athletic gear. Using it must be a standard no matter what age the person is. Even if contact sports like martial arts and boxing are the only ones that can put you at high risk for mouth injury, any athlete can suffer from tooth loss or mouth injuries unexpectedly. This is true even with those who participate in non-contact activities and sports. Custom made – These mouth guards are designed for unmatched comfort and fit. They are made exactly to your own specifications and needs by a dentist. Boil and bite Mouth Guards – These types of mouth guards are available in many drug stores and sporting shops, they are able to provide a decent fit for your mouth than most stock mouth guards. These mouth guards are softened in boiling water, and then placed within the mouth so that it can take on the proper shape of your teeth and gums. You need to follow the instructions of the manufacturers carefully so that you can get the best results. Stock mouth guards – These types of guards are ready to wear. Although they typically do not fit perfectly, they can be used right away and they are less expensive. Another downside to this type of mouth guard is that they can also be too bulky and they can make breathing difficult for the wearer. A custom-fitted mouth guard is very important for individuals who are wearing braces or fixed bridge-work. It can be very easy for a sudden impact or blow to the face to damage brackets or other orthodontic fixtures. Since a mouth guard can create a barrier between your braces and your cheeks, it can also help protect these soft areas from injury. You need to talk to your dentist when it comes to selecting the right mouth guard so that you will be able to have the best protection possible for your mouth. Your dentist might recommend that you opt for mouth guards that cover both the upper and lower teeth if you have braces or fixtures on these areas. Retainers and other removable dental appliances must be removed prior to participating in contact sports. You can talk to your dentist so you will know when to replace your mouth guard. Any form of wear and tear on the other hand, should be an indicator that your mouth guard needs immediate replacement. If your mouth guard gets easily damaged, or is not able to provide you with a comfortable fit, you should replace it as soon as possible. 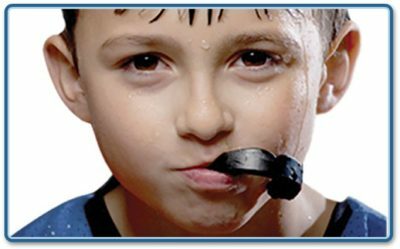 Children and teenagers need to have their mouth guards changed often in order to accommodate their growing needs. During your visit to your dentist, bring your mouth guard with you so you can have it checked by your dentist. You dentist might even clean it thoroughly for you.